Searching through results for today's Trove Tuesday post I decided to explore the subset of illustrated articles. When searching the digitised newspapers on Trove, users have the option of refining their results by newspaper title, category, illustrated, decade and word count. If you select illustrated from the list, further refining options will also be presented and can include photo, illustration, map, cartoon and graph. Interestingly, depending on the number of results you have, the options may appear doubled - for instance photo and Photo may appear in the list. Now even though we may know they are one and the same, Trove unfortunately cannot tell the difference between the two and will treat them as separate subsets. So a good hint to remember...if you are searching within these subsets, make sure you search in both if they listed. 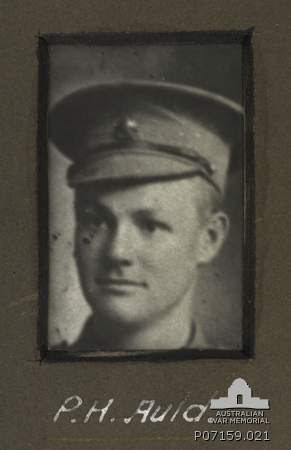 The Military Cross has been awarded to Lieutenant Patrick H. Auld, son of Mr. G. Auld, of Adelaide. The young officer is only 23 years of age. Although wounded he led his men forward to reinforce part of the front line, displaying great courage and initiative. He set a splendid example to his men. Lieutenant Auld was employed at the South British Insurance Company prior to enlisting, and he left here as a private in the 4th Field Ambulance in 1914. He has now served in Egypt, Gallipoli, and France. He was a student of St. Peter's College, and played in inter-collegiate football and cricket matches. Lieutenant P. H. Auld, M.C. From this article and photograph I decided to research further in order to find out more information about the Military Cross and Patrick Howard Auld in general. Instituted on 28 December 1914 by King George V, the Military Cross is a level three gallantry award. The Military Cross is awarded in recognition of gallantry during active operations against the enemy. Born in Kent Town, South Australia on 30 May 1894 (SA birth index number - 1894 Book 544 Page 175), to parents William George Auld (known as George Auld) and Ellen Howard nee Clarke, Patrick Howard Auld was the grandson of explorer William Patrick Auld. The WW1 service records for Patrick Auld [see B2455, AULD P H] held at the National Archives of Australia, before Patrick joined the Australia Military Forces on 4 November 1914, he had been working as an Insurance Clerk and was also serving with the 79th Infantry attached to the Citizens Forces. Upon joining the Australian Imperial Force he was attached to the 4th Field Ambulance with the rank of Private. He left Australia on board the HMAT A35 Berrima from Melbourne on 22 December 1914, bound for service in Gallipoli. According to World War Diaries (AWM4, Sub-class 26/47) from the 4th Australian Field Ambulance held at the Australian War Memorial, the April 1915 [item 26/47/5] and May 1915 [item 26/47/6] diaries list Patrick as being attached to B Section under the command of Major Jermyn, arriving Gallipoli on 27-28 April, just two days after the initial landing at Anzac Cove. April 1917 saw the 50th Battalion participating in the advance to the Hindenburg Line during the German retreat. The attack on Noreuil started on the morning of 2 April and it was during this battle that Patrick sustained a gun shot wound to the buttock and had to be evacuated to hospitals back in England. Eight months later, in early December 1917, Patrick rejoined his unit. By March the following year, the 50th Battalion was again in the thick of the action as the German Army launched a major offensive on the Western Front. On 1 January 1918 Patrick received a field promotion to the rank of Captain. By early April, the 50th Battalion were defending Villers-Bretonneux against the Germans push, but the Germans captured Villers-Bretonneux on 24 April. Official records [B2455, AULD P H] reported that Patrick Auld was missing in action on 24 April, but he was captured by the Germans on 25 April and ended up in the Officer Prisoner of War Camp in Karlsruhe, Germany. After World War 1 ended on 11 November 1918 Patrick was repatriated to England on 1 December. He returned to Australia on board the SS Port Dennison on 25 March 1919. Patrick later served in World War 2 during 1942-43 and was discharged as a Major. He passed away at the age of seventy eight in July 1972 at Beulah Park, South Australia.